Remember me? I am the new edition of the “Insider” which you probably haven’t seen for a while. 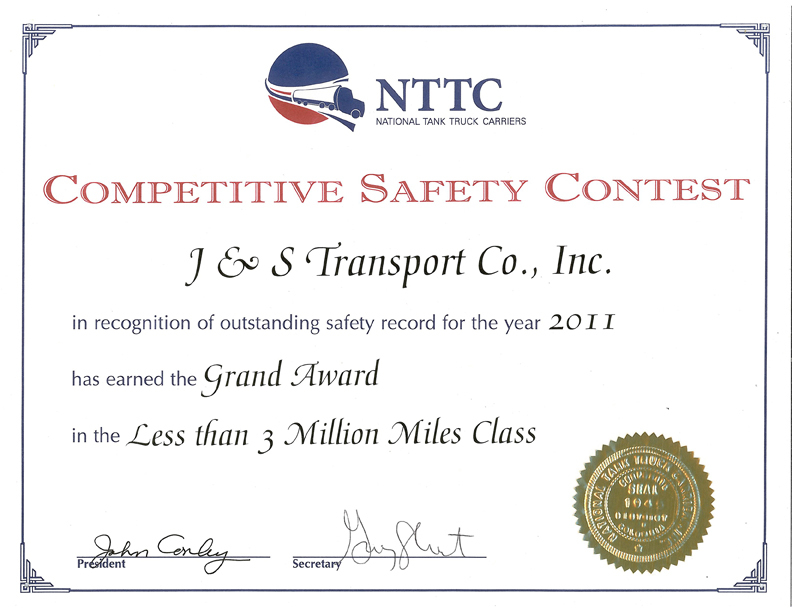 Our apologies for the hiatus but I’m back to provide news about J & S Transport, our industry, with a major focus on SAFETY. Steve Powers (a.k.a. Safety Steve), you know our somewhat new Safety Director, has settled into the job and thinking of ways to keep J & S Transport’s employees safe. Steve was using a monthly Driver Letter to spread awareness but soon discovered our newsletter was not being used. Steve then thought, why don’t we do both giving J & S Transport’s family a venue to share information and awareness? We can always use your feedback, input and ideas to ensure continuous improvement. Your Safety Committee has new members. Jim Donovan and Bill Hinchliffe were elected to the seats vacated by Carlos Olivar and Wayne Lee. Our sincerest appreciation goes to Carlos and Wayne for their years of service to the Committee. Standing members include Steve Powers, Bob Hoyt, John Hamel and Sharon Hamel. We cannot stress enough having Jim and Bill be your conduit to bring issues to the committee. For those employees who are not comfortable talking with management, this is an excellent means to make your concerns known. We are all aware of the new Boston Hazmat Route. John Hamel has provided extensive insight to the new regulations and his expectations for all our drivers. Any questions you continue to have, please let John know. Congress passed a version of the long awaited Highway Bill. Our industry was closely watching to see how the “Wetline” issue would proceed. Thankfully, the new Bill provides a temporary ban on the ability of the U. S. Department of Transportation to issue a final rule to ban wetlines–flammable product in the unloading lines of cargo tanks. That rule was on the DOT regulatory agenda for action by the end of this fall. If allowed, our industry would have to alter the piping on the undercarriage of the tanker to eliminate any product residue from being in those lines; a very expensive undertaking for any tanker fleet! All drivers are aware of the Final Ruling issued by the Federal Motor Carrier Safety Administration regarding Hours of Service. The Ruling becomes effective on July 1, 2013 with the key changes include limiting restarts to once per week with the restart covering at least 34 hours including 2 periods between 0100 and 0500. You will be receiving more information as we determine how best to comply with this new regulation. John and Sharon Hamel went to the Annual National Tank Truck Carrier Meeting in San Francisco, CA. 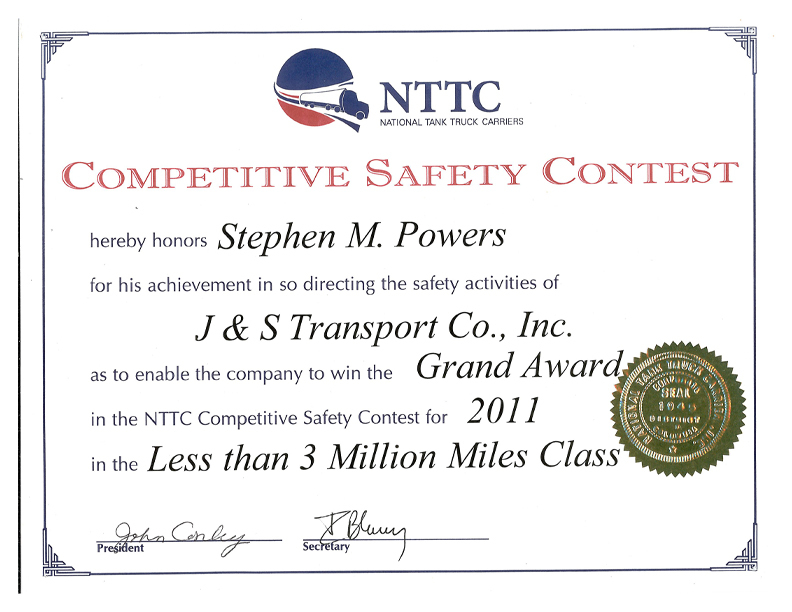 The highlight of the meeting is when our industry recognized J & S Transport with the 2011 Grand Competitive Safety Award. None of this recognition would have been possible without you, the professional driver, operating our transport vehicles. John Hamel was elected to the Board of Directors for Massachusetts Motor Transport Association. John also was appointed to the Executive Committee and the Legislative Committee for the Association. We can all rest assured that John will keep the interests of our industry in the forefront on Beacon Hill. Safety Steve was named to the Safety Council of MA Motor to share his knowledge and experience among the membership. All Commercial Motor Vehicle Drivers need to undergo recurring medical physicals in order to be certified to drive for J & S Transport. One emphasis the DOT is placing on examining physicians is to check for Obstructive Sleep Apnea (OSA). They do this by asking if the driver snores a lot, awakes frequently or has any other sleeping disorder. The other way they check is to measure the driver’s Body Mass Index (BMI). If the BMI is above a specified limit, the physician may require the driver to participate in a sleep study at a certified sleep lab. If the driver is diagnosed with OSA, he may have additional requirements to complete prior issuing of a new medical card. One factor of OSA is the driver’s weight. 1. In a shallow bowl, combine the egg white and buttermilk, beating lightly. 2. On a plate, combine the Parmesan cheese, oregano, basil, flour, and bread crumbs. Dip each piece of chicken in the egg and then in the flour mixture, making sure to completely coat each piece. Set the chicken aside. 3. Heat a large non-stick skillet coated with non-stick cooking spray over medium heat. Add the chicken, and cook until lightly browned. Turn the chicken, and cook several more minutes or until almost done. Lower the heat, and cover the chicken with pasta sauce. 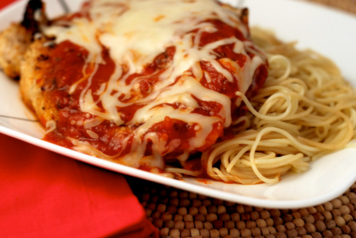 Top with the Mozzarella; cover and cook several more minutes, or until cheese is melted. Serve over a bed of pasta.